$164 - Transporting us to a time filled with old world charm and elegance, this new girls dress from Tutu Du Monde will brighten the light in her eyes. The soft lilac is the perfect color for spring and summer. A touch of shimmering satin forms the adjustable straps and trims the U neckline. Gems and beads fall from her neckline with long whimsical boa feathers found beneath. 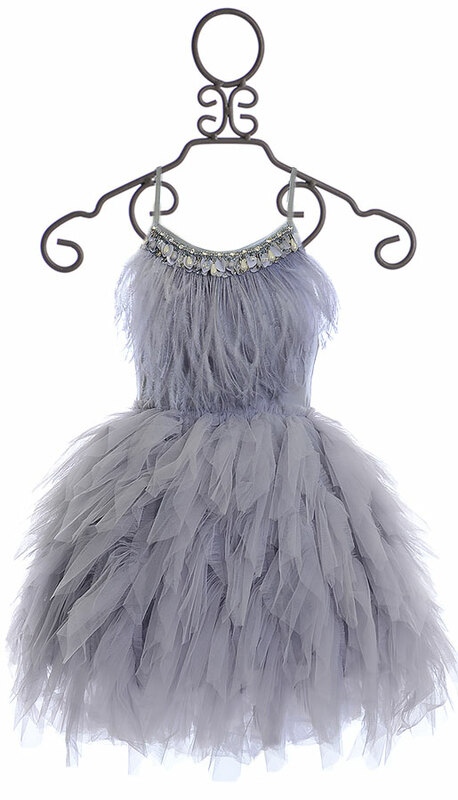 The skirt is piled high with tulle, created the full look that is sure to make her feel like the Swan Queen. We adore that these layers create a cascading hemline! 100% Cotton Shell. 100% Nylon Knitted Fabric. 100% Cotton Lining. Exclusive of Decoration. Dry Clean Only! (1) SIZE 4/5 REMAINING.